a food processor) until the mixture resembles breadcrumbs. 2. Lightly beat the egg yolks with the brandy (or orange juice) until smooth. Pour this into the buttery flour, mixing until you have a soft paste. Don’t worry that it’s too soft to roll, a spell in the fridge will cure this. Scrape the dough onto a sheet of baking parchment, pat out into a rectangle about 2–3cm thick, then wrap in clingfilm and chill in the fridge for at least 30 minutes until firm. Meanwhile, stir together the ingredients for the mincemeat filling. 3. Preheat the oven to 200°C, gas mark 6. Remove the dough from the fridge and cut in half (it’s easier to roll in batches). Roll out on a lightly floured surface to the thickness of a £1 coin, easing it free of the worktop using a metal spatula or palette knife as you roll and dusting with more flour to prevent sticking. (Alternatively, roll between two sheets of clingfilm.) Stamp out circles large enough to be pressed into the holes of a bun or mini muffin tin with a bit of pastry peeking over the edge. 4. 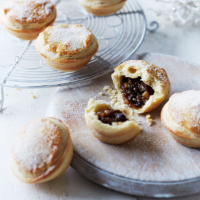 Once all the holes are lined with pastry, fill each almost to the top with the mincemeat mixture. Roll out the remaining pastry and cut out circles just big enough to cover the cases. Place on top of each pie and carefully seal the edges using your fingers. 5. Bake for 20–25 minutes or until the pastry starts to colour and the filling is almost boiling. Remove from the oven, leave to settle for a minute, then use a blunt knife to ease around the edges and carefully remove them from the tin. Dredge with caster sugar while still warm, before serving.